Store, protect, and transport your tripod and accessories in the black padded Roll-Along Tripod Cage in large from Sachtler. This case is designed to hold a 41.7" tripod. It has a large zippered accessory pocket on top, dual top handles with a connector in the middle of the case, a flap closure on three sides for easy access, and three adjustable straps with quick release buckles. The top of the case has a useful haul handle which functions in combination with the two wheels on the bottom, for rolling over level ground. The bottom wheels are spaced wide apart for enhanced stability. The bottom end opposite the wheels has two feet for enhanced stability. Made of polyester and nylon, your Roll-Along Tripod Case is both durable and strong. 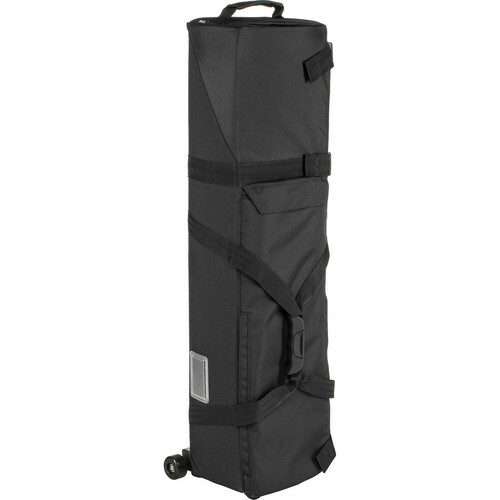 Box Dimensions (LxWxH) 43.0 x 12.0 x 12.0"
Roll-Along Tripod Cage (Large) is rated 4.3 out of 5 by 3. Rated 4 out of 5 by Brian U. from Solid bag Overall the bag is great and seems very protective. I like the handles on the outside of it too, which makes for easy transport. The only issue was its not quite as big on the inside as I was hoping it would be. But that's probabaly my own fault considering it gives you the interior dimensions. I'm still able to fit my sticks and slider in it with a few extra things so that's great. Rated 4 out of 5 by Webby from Well made and good value for money I bought this to replace a Kata tripod bag I have been using for 15 years. So I will be interested to see if it performs as well over the next few years. What I did think was a redundant part of the case, was the back pack straps. I cut them out and now use the pocket to hold a rain jacket. Case is well made and I look forward to road testing it fully. Rated 5 out of 5 by Anonymous from Amazing Bag! On the go wedding videographer I can fit 2 tripods, 1 mono pod and my slider in here. Quality is amazing! Just ordered another Sachtler bag for my cameras. I'm looking for a travel bag to fly with that can fit both my tripod (Manfrotto MVH502A546BK-1 Pro Video MVH502A with 546B Tripod) and my slider (ikan SLD02 Deluxe Slider Kit (1 Meter)). This this bag will fit both? Thanks for the help! Technically the case will be large enough. But you will most likely need to take the legs off the slider. I am going by dimensions only and this has not been tested.You also might want to use some padding around at least the tripod head. With padding you might want to use a larger or wider case.